Strangles is a prevalent disease, with more than 600 outbreaks recorded on average in the UK each year, as cited by the Animal Health Trust (AHT). But it doesn’t have to be this way. 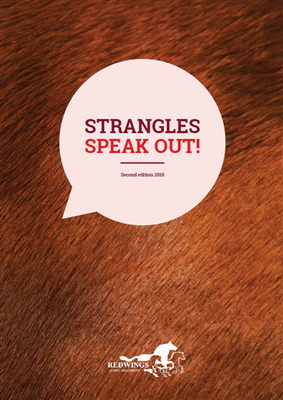 Redwings Horse Sanctuary is striving to protect horses, owners, businesses and the wider equestrian community from the misery caused by this highly infectious disease through its award-winning “Stamp Out Strangles” campaign – and a primary tool in helping them achieve this is the charity’s latest edition strangles information pack. Originally published in 2012, the second edition pack has evolved to include the latest veterinary research and findings from Redwings’ 2016 Strangles Survey. Over 90% of the 2000+ horse owners completing Redwings’ Strangles survey believed the disease should be more of a priority in the UK, and 75% said they would be likely or highly likely to choose a livery yard that screened new arrivals. The interest and willingness of horse owners to improve biosecurity standards and help stamp out the disease is therefore evident. And, indeed, yards have been responding with increasing numbers developing screening policies, but more can be done. “The first step in tackling strangles is understanding the disease and our strangles prevention pack aims to help horse owners and livery yards do just that” explains Redwings’ Education and Campaigns Manager Andie Vilela. “As well as myth-busting and continuing to eradicate the strangles stigma, this new edition is packed full of information and practical, easy-to-follow advice regarding identifying symptoms, protecting your horse from strangles and what to do in the case of an outbreak. “We know how important vet practices are in delivering timely and trusted horse health advice to owners. Even more so in the case of a strangles outbreak. We are therefore asking vets to sign-post yards and horse owners to our advice pack. “Unfortunately, we tend to learn biosecurity practices through experiencing an outbreak but owners shouldn’t need to ‘learn the hard way’. Through our Stamp Out Strangles campaign, we’re saying to owners, ‘don’t let an outbreak be your incentive to change!’ We want to see improved infectious disease prevention through promoting meaningful screening protocols on yards and ensuring more horse owners monitor their horse’s temperature as an indicator of infection. As well as drawing upon the wealth of in-house expertise at the Sanctuary, Redwings’ second edition strangles pack has benefited from being peer-reviewed by leading experts in biosecurity and horse owner education, including Dr Andrew Waller (AHT), Jan Rogers (Horse Trust), Professor Josh Slater (Royal Veterinary College), Roly Owers (World Horse Welfare), and has been endorsed by the British Horse Society and the British Equine Veterinary Association (BEVA). Redwings’ strangles pack with practical quarantine poster inserts can be downloaded and shared for free here. The pack is also available free of charge to veterinary practices to share with their clients and can be obtained by emailing education@redwings.co.uk.